The World Shifts Behind SMOKE & MIRRORS–Review and Giveaway! Hi there! Today I’m sharing a release day review for the latest book in the M/M alt-world shifter, police romance saga that is THIRDS by Charlie Cochet. 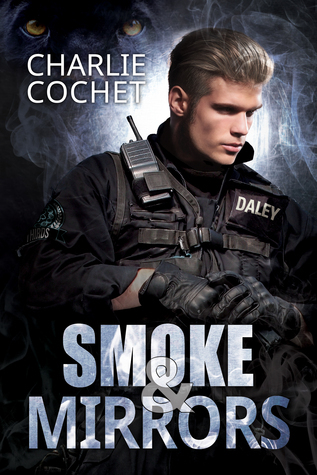 I’ve loved all SEVEN books in this series, and SMOKE & MIRRORS is no exception. Want more info on the previous books? Click THIRDS, RACK & RUIN, RISE AND FALL, and AGAINST THE GRAIN. This book is the 7th in a series and really best enjoyed when read in order. THIRDS is set in an alternate world where a disease resulted in an altered human state–Therians are a new race of shifters that exist side-by-side with Humans, and there’s often trouble. Police officers of THIRDS are matched Humans and Therians partnerships, and they are sent out to settle civil, criminal and domestic disputes (think SWAT, but for shifters) that involves shifters. Dex and Sloane have been partners in THIRDS and partners in love for over a year. They have survived many a tragedy, together, and are now openly living together. Sloane recently “marked” Dex, scratching him with his jaguar claw. This is a very dangerous bargain, because marking results in an open link between their emotions. Dex can feel Sloane at all times, and comes to crave being in Sloane’s presence. Also, the scent of Sloane on Dex is a cause for problems, as other Therians see Dex as a mark to be claimed–a prize to be won. It results in quite a lot of conflict, fending off these would-be mates. Dex, Sloane and the rest of their THIRDS team have been steadily, covertly, training in TIN–Therian Intelligence Network–physical tactics, and it greatly benefits Dex when he’s kidnapped and needs to escape what is clearly certain death. His torture by a Therian Spook called Wolf sets Dex on a path of discovery about his parents. John and Gina, who were murdered when Dev was only 5, may have been covert operatives, but for whom? Unreliable sources say they helped incorporate Sloane, Ash and other First-Gen Therians into the youth experimentation project that was little more than torture for years on end. It’s more than Slaone can take, thinking that Dex’s mother was somehow involved in his horrible youth–and that’s a big wedge to their otherwise healthy relationship. It’s also clear that Dex isn’t exactly unchanged after his rescue. The Therians around him are experiencing some odd, and downright baffling, responses to his presence. When Ash buys Dex gummi bears we KNOW there’s something BIG happening–and I liked how both the mystery of Dex’s parents and Dex’s subtle transformation were two intertwined plot-lines. This adds a whole new layer to the THIRDS saga, and still keeps the other relationships intact. Speaking of relationships, there are two that are brought front-and-center in this book. A reunion and a revelation, and I think readers will be happy with both. Also, sexytimes for Dex and Sloane have never been more molten. Good gravy! And, there’s still that winsome humor to lighten up the dark moments. Lots of seriously good counseling from supporting cast–never thought I’d be saying this, but thank goodness for Ash! I experienced a small trip down memory lane going through Dex’s treasured childhood belongings, as I was a Care Bear Kid back in the 80s, too. This one’s going to bring out the feels in so many unexpected ways; even as I cursed Sloane, I still wanted to love him up. And then smack some sense into him. And then love him up again. Don’t judge me! I wanted to love Dex up, too!! The end isn’t a cliffhanger, but it certainly leaves a wide range of possibility for new stories, adventures, and mayhem. Me, and my Cheesy Doodles, can’t wait. Interested? You can find SMOKE & MIRRORS on Goodreads, Dreamspinner Press, Amazon, Barnes & Noble, and AllRomance. ALSO!!! Dreamspinner Press is having a THIRDS anniversary sale. Get 30% off Books 1 – 6, including paperbacks! Sale ends at 11:59pm (Eastern US time) Sunday, July 10th. Check out Charlie’s THIRDS 2nd Anniversary post for you chance to snag one of the MANY prizes Charlie’s offering! 5 winners: THIRDS agent T-shirt. 5 winners: Destructive Delta tote bag and character cards. 4 winners: THIRDS swag pack (Destructive Delta tote bag, character cards, THIRDS postcards, stickers, bookmarks). 3 winners: THIRDS audiobook of your choice. 3 winners: $10 Amazon Gift Card. 3 winners: Mini Sloanes with character cards and dog tags. 1 winner: THIRDS agent coffee mug with character cards. 1 winner: Star Wars Leia and Han Solo bag with compact mirror.